The call to authorities came in a resolution voted on Thursday in Strasbourg. The vote coincides with the International Day to End Immunity for Crimes against Journalists. Since a failed coup on July 15, the Turkish government has arrested at least 99 journalists and writers, revoked the press credentials of at least 330 journalists and closed the offices of more than 100 media outlets, leaving over 2,300 media workers without jobs. In a debate in the EP on Thursday, MEPs were told that since the coup, at least 99 journalists and writers have been arrested, denied the right of access to a lawyer and kept in inhumane conditions in which they are threatened and mistreated. The European Federation of Journalists and the Turkish Journalists’ Association also said the offices of more than 100 broadcasters, newspapers, magazines, publishers and distribution companies had closed, leaving over 2,300 journalists and media workers without jobs. “A free and pluralistic press is an essential component of any democracy,” and open society, the resolution states. Turkey’s government should “narrow the scope of the emergency measures, so that they can no longer be used to curtail freedom of expression” and not use the “broadly defined Turkish anti-terrorism legislation” to punish journalists, MEPs said. 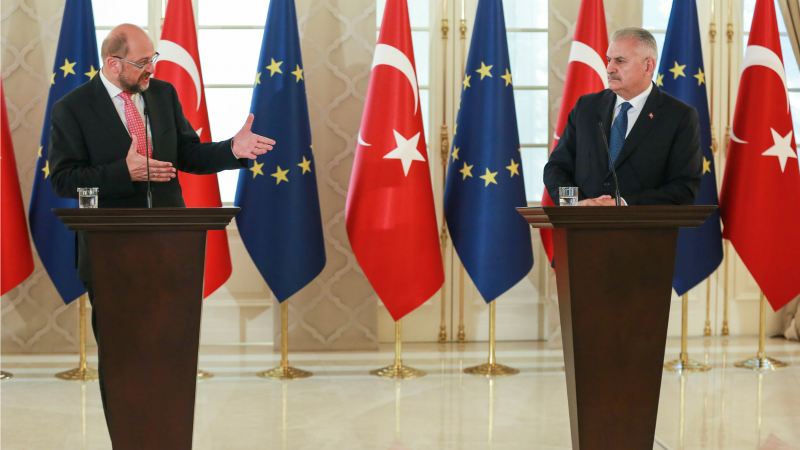 They called on the European External Action Service (EEAS) and member states to closely monitor the practical implications of the state of emergency declared following the coup attempt. This article originally appeared in Turkish Minute on October 28.